Incase you missed the first instalment (where have you been?) Amelia’s magazine caught up with London based women’s wear designer Brooke Roberts to find out about her inspired new collection. Sinnai dress (reversible) in exclusive silk/ glassino jacquard knit. Can you tell our readers a little more about your SS10 collection? Right at the beginning of the project I took a brain scan which took about 50 image slices through the brain. I then artworked the images with a CAD designer friend who helped to manipulate them into python skin effect, treat and repeat patterns that I then merged with Yoruban sculpture. To learn about this Nigerian tribe I went to the British Museum and looked at all of the sculptures and masquerade videos, approved taking colour inspiration and texture ideas from their artwork. The collection is a mixture of medicine, science and Yoruban culture. You’ve said that you take a lot of your inspiration from your work as a radiographer and with that in mind I wondered if you were interested in fashion trends and if you try to reflect current trends in your collections? As a designer I can’t really ignore the industry behind my profession, but I try not to let outside influences take over my inspiration and vision. Trends are really important. I try not to follow them or reference them too much in my work. Trends happen to find their way into my collection one way or another, often from working with suppliers. For example my thread and fabric suppliers have their own seasonal trends, textures and colours for the season which I end up inevitably incorporating. I’ve also been known to look on WGSN from time to time. Exar suede washed denim jacket with ortho fringing, sinnai leggings in exclusive silk/ glassino jacquard leggings and silver and red gold skull slice earrings. Exar suede washed denim jacket with ortho fringing (ortho fringing is made from metal plates that are used to straighten and repair bones within the body). I love Thierry Mugler. It doesn’t matter how many times I look at his work. I’ve got quite a few of his vintage pieces and I love wearing them! Rifat Ozbek is another I like and John Galliano is great too. It’s like a dream for a designer to work in a house like that (Dior) where you can create your own fabrics; it’s a beautiful fusion of craft and technology. I also love Alber Elbaz, he’s so commercially brilliant – I think most women want to wear his clothes! His designs are so romantic; I think he’s got a real sensibility with fabric and movement. I also love Gareth Pugh; he would be the young designer I like. What are you looking forward to in the next decade seeing as 2010 is fast approaching? I’m looking forward to just developing my label, growing it and evolving. I want to learn more, as in this kind of job you’re learning everyday and are exploring new ideas and techniques. I’m trying to work with the Australian wool industry to integrate Australian merino into my knitwear because it’s a beautiful product and I love knitwear so I’d like to explore it and at the same time if I can help out the Australian wool industry it’s a good move, especially as my family are wool growers! 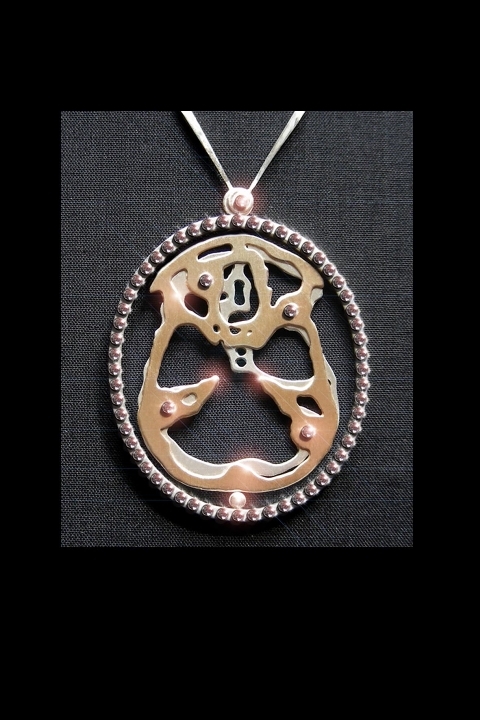 Silver and red gold spinning skull slice pendant- diamond set. Lastly, do you have any strategic tips or advice for anyone toying with the idea of a career in fashion, with the ambition of going it alone as a designer? You need to have a strong idea of what you want and what you want to be first. Then I’d suggest going out and finding the best experience you can so intern and put in a lot of hours. Learn, develop and once you feel ready to start a label get some good business advice and then apply for all the awards as a way of getting support. Just work really hard! Brooke’s current collection is stocked at King and Queen of Bethnal Green. Future Map is the annual University of the Art’s exhibition in which they have selected the best of the current graduating year (MA and BA) from across their vast range of colleges. This year the show opened on the 25th November at 20 Hoxton Square with the awarding of the 176/ Zabludowicz Collection Future Map Prize going to Cindie Cheung for her wryly-amusing short video pieces titled “One Girl in an Office with Coca Cola and “Untitled.” Accordingly these films appear to ask questions about the representation of women in popular culture, and mainly through celluloid mediums such as Film and TV. The music also composed by Cheung added additional feelings of extreme posturing at the slight film roles offered to women in British and American Cinema. In the shorts Cheung’s smile comes across as a grimace extracted by the camera, her feelings of frustration being borne out upon a sleek wooden table in the manifestation of a patriarchal society: the office. For the past twelve years Future Map has provided the opportunity to see the variation within the field too often shortened to “Art and Design” through the inclusion of MA and BA Jewellery designers, Fashion Artifacts MA students, graphic designers interior and spatial designers alongside the usual elements of contemporary Fine Art; painting, drawing, Sculpture and video. This decision results in the inclusion of the starkly clinical pieces created by Leyla Kashanipour . These innovative, politically motivated designs refer to female suppression in Iran. Compared to the currently fashionable ‘hard’ adornments adorning the fashion pages Kashanipour’s physically aggressive pieces takes the breath away, with their hint at the suppression which can arrive in the form of a box. The animation CUT by MA fine artist Kristian De La Riva is based upon the loss of a relationship and creative partnership. The beautifully cartoon drawn through an apparently simplistic black line, drew a far amount of giggles on the opening night. Subjected to various actions of bodily destruction, repairing itself endlessly, the cartoon’s stuck in its own version of Groundhog Day. Doomed to a life of perpetual self-debasement at the end of a relationship. Zoe Paul’s translation of Hellenistic Sculpture re-expresses art historical notions of worth and grandeur through the language of the bathroom tile and its accomplice; grout. Paul expresses the tensions present on the surface of sculpture through her considerations of the relationship between material and subsequent fetishising by the museum. Una Burke’s piece created for her MA in Fashion Artefact encapsulates fashion and the history of art’s prevalence to cast the female form as an object of fetish desire through representing it via the idea of human trauma. The sculpture’s kneeling position enables it to function as a modern update of Greek statues and their portrayal of an ideal femininity. The beautiful piece occupies the right hand side and is mesmerizing for it’s delicate strength. A particularly attractive piece of communication design came from Raju Rahman BA Graphic & Media Design – London College of Communication in the form of a poster reminiscent of the old underground designs advertising a sale of artifacts created by the artist. Where as the slightly more typical graduate sculpture of Maurice Daniel Citron MA Fine Art - Central Saint Martins drew eyes to its central location with the gallery space. Elisa Strozyk’s (MA Design For Textile Futures, Central Saint Martins) beautiful balance between 3D and 2D left the viewer transfixed at the re-presentation of geometric shapes, that appeared to be woven but on closer inspection turn out to be constructed from tiny pieces of wood, questioning ideas of textile function sitting between home furnishing and sculpture. A particular favourite being Sonny Sanjay Vadgama’s Eye for an Eye video, in which the watches the endless destruction and rebuilding of the Biruit Hilton, the narrator providing moral outrage at the endless consuming nature of war and ideological clashes. The exhibition runs until the 23rd December 2009 at 20 Hoxton Square Gallery. Opening Hours: Tuesday – Friday 11am – 6pm, Saturday 12am – 6pm? Nearest Tube: Old Street. Future Map is the annual University of the Art’s exhibition in which they have selected the best of the current graduating year (MA and BA) from across their vast range of colleges. This year the show opened on the 25th November at 20 Hoxton Square with the awarding of the 176/ Zabludowicz Collection Future Map Prize going to Cindie Cheung for her wryly-amusing short video pieces titled “One Girl in an Office with Coca Cola and “Untitled.” Accordingly these films appear to ask questions about the representation of women in popular culture, no rx mainly through celluloid mediums such as Film and TV. The music also composed by Cheung added additional feelings of extreme posturing at the slight film roles offered to women in British and American Cinema. In the shorts Cheung’s smile comes across as a grimace extracted by the camera, viagra 40mg her feelings of frustration being borne out upon a sleek wooden table in the manifestation of a patriarchal society: the office. For the past twelve years Future Map has provided the opportunity to see the variation within the field too often shortened to “Art and Design” through the inclusion of MA and BA Jewellery designers, try Fashion Artifacts MA students, graphic designers interior and spatial designers alongside the usual elements of contemporary Fine Art; painting, drawing, Sculpture and video. The ExtInked project dreamt up by the Ultimate Holding Company to mark Charles Darwin’s bicentennial birthday is no doubt one of the most unique and amazing projects I’ve heard about in a long time. Along with an exhibition illustrating 100 of the most endangered animals in the British Isles, store the event came to an astounding conclusion with the tattooing of 100 volunteers who then became ambassadors for their animal. So as the exhibition closed yesterday, store what is to become of the ambassadors, sildenafil now back in their natural habitats? My friend Tom was lucky to be involved in the project and here he shares his experiences with me. So why did you take part in the ExtInked Project? Since getting involved with UHC sometime last winter, I’ve been a part of a number of really interesting projects with them. ExtInked was something they have been talking about for a long time and the idea always really appealed to me. I think it’s a really great thing to be a part of, people have learned so much about which animals are endangered and hopefully will think about why that is, and what can be done about it. For me, I try to make a lot of environmental decisions in my life and feel extremely passionate about the use of animals and our finite natural resources for human gain. Wildlife conservation and the environment are extremely important, in our relatively short time on this earth we have managed to destroy so much. Positive and big things are happening from the ground up. There is a fast growing environmental movement, but the important decisions need to be made from the top, which, unfortunately is not happening nearly enough. It seems easier for leaders of governments and corporations to pretend they are doing something, rather than making an important change, that could make a really big difference. Ext Inked was a great way to be involved in one of the most creative bottom-up environmental actions I know of, I now have a species permanently on my body, which throughout my life no doubt, hundreds of people will ask about, and I will be able to tell them the information I learned about that particular species, the project, the movement, and, in my case, the RSPB and other organisations helping to protect birds in the UK. Which animal did you get? Tell me about the tattoo! 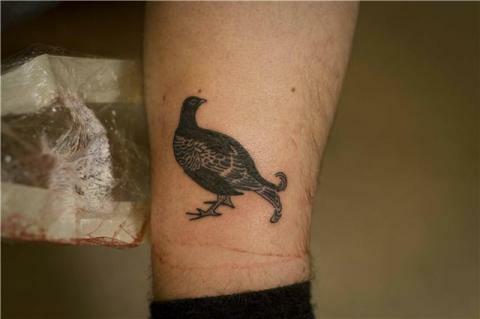 I went for the Black Grouse; I love birds, so for me it had to be a bird. The black grouse is found in the north of England, much of Wales and Scotland. I think to me, it was important to get something that I would be likely to come into contact with, I love golden eagles and leatherback turtles, but I’ve never seen either unfortunately! I don’t think it really matters too much which species I had tattooed though, as it’s more about the project and the issues as a whole than one particular species. Tell me about the experience! What happened when you went to Manchester? We went along on the last day around lunch time, which was bit quieter than when I visited on the Thursday night. I was quite pleased about that as all the tattooing happened much like a tattoo convention. There were barriers up at the front, and a stage with the three tattooists from Ink vs. Steel in Leeds, tattooing live in front of whoever was there to watch. As it was my first tattoo, and I didn’t know how much it would hurt, I was a bit nervous about being watched! I thought I was being tattooed at 1 o clock, but somebody was running late, and I was early, so they switched our places, I didn’t really have any time to feel too nervous, before I knew it I was laid face down, being tattooed. I’d be lying if I said it didn’t hurt, because it did, but the mix of the atmosphere, and the rush of adrenaline you get puts you in a really strange place. I just laid their trying to work out how much it hurt and which bit he was doing, it was actually a pretty good feeling! Having had the tattoo a couple of days now, the pain seems totally insignificant. Your girlfriend was part of the project too wasn’t she? My girlfriend Sally got involved too; she got the Rampion Bellflower on her inner arm. She has a lot of tattoos already, so I think she probably had a different experience to me, although she was still a bit nervous. She was really excited to be a part of the project and has already done some good work telling people about the project and spreading the word! Sally is a very creative person, but isn’t able to be too involved in art, so I think it’s great that she really connected with this project and was really receptive to the ideas artists had on conservation. What about the future? How do you think you’ll feel about the tattoo in 20 years time? In twenty years time I have no idea how I will feel about the tattoo, but the more I live, the more I learn, and the more I learn, the more passionate I become. Climate change and human activity is affecting our wildlife, and that’s only going to get worse unless we act quickly and dramatically. If we act now, while we still have a bit of a chance, I will be able to look at my tattoo and think, I’m glad we did something, and If not, I don’t think anybody will see it because my leg will probably be under water!